The wailing and gnashing of teeth over deflation has begun anew. With the CPI showing a decline in April, folks like Paul Krugman and Greg Ip are concerned about a Japanese-style deflation emerging in the United States. Other observers like Tim Duy and Scott Sumner are similarly concerned as they fear U.S. aggregate demand is going to get increasingly weak. I do not mean to be a contrarian here, but I am having a hard time seeing how these concerns are justified. Yes, the U.S. economy has been plagued by a weak recovery, but the image one gets from this discussion is that we are standing on the precipice of another collapse in spending. If so, the data sure don’t show it. 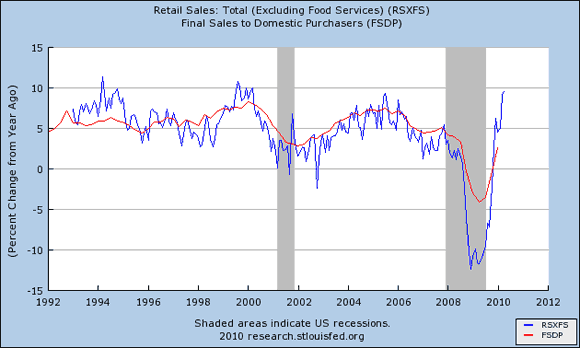 Take, for example, monthly retail sales. It grew at a year-on-year rate of almost 10% in April as can be seen in the figure below. The figure also shows domestic demand through 2010:Q1. Given the strong correlation between these two series, it seems likely that the strong growth in current retail sales will also be seen in domestic demand once the numbers are released. Of course, the above figure only shows current values. 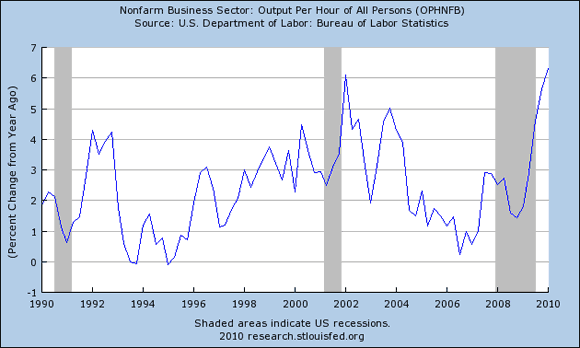 It is possible that the current growth in demand may not be sustained. But that is not what the consensus forecast says. Below is a figure constructed from the Philadelphia Fed’s quartely Survey of Professional Forecasters. 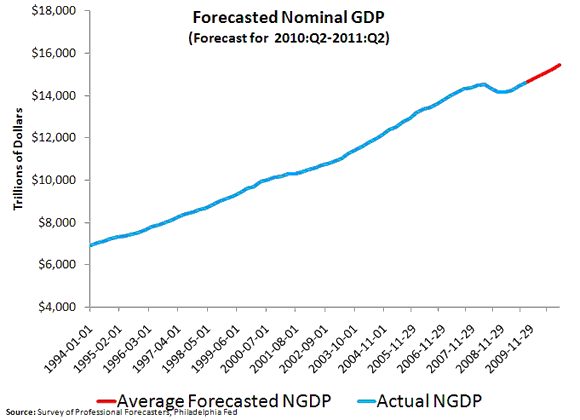 This figure shows the recently released average forecast for nominal GDP (NGDP) for the period 2010:Q2-2011:Q2. No sign of an expected aggregate demand collapse here. As I noted in my previous post, this spike in the productivity growth rate may be why the unemployment rate has been remained so high. If, in fact, this productivity surge is the cause of the downward price pressures then here is another case that illustrates why it is important to distinguish between deflationary pressures arising from a negative aggregate demand shock versus those coming from positive aggregate supply shocks. I have written about the importance of this issue before, especially with regards to the 2003 deflation scare.